Kim Kardashian is still taking a break from the Internet since being robbed in Paris more than a month ago, but her brother Rob Kardashian started pitching in this week to update the family's curious fans. Although it's been two weeks since Halloween, Rob shared new photos of the family's costumes on his sister's subscriber-based website and app. 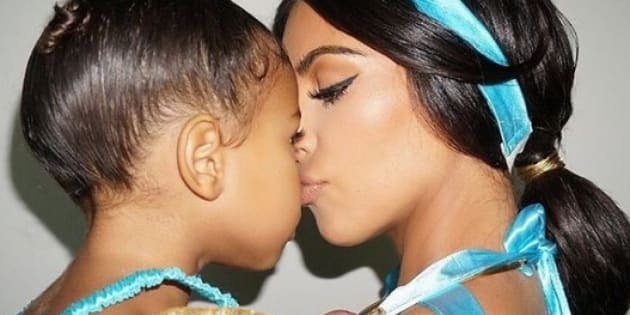 She and three-year-old North West sported matching Princess Jasmine costumes based on Disney's "Aladdin." The 36-year-old reality star wore the same costume seven years ago, and she pulled it out again to twin with both daughter North and her son Saint, who dressed as Aladdin. She and the family posed for photos at home and enjoyed some family time at a Halloween dinner planned by Kourtney Kardashian.